Meet Harry. Harry is four and is vision-impaired. He has profound developmental delays. But, Harry is lucky. 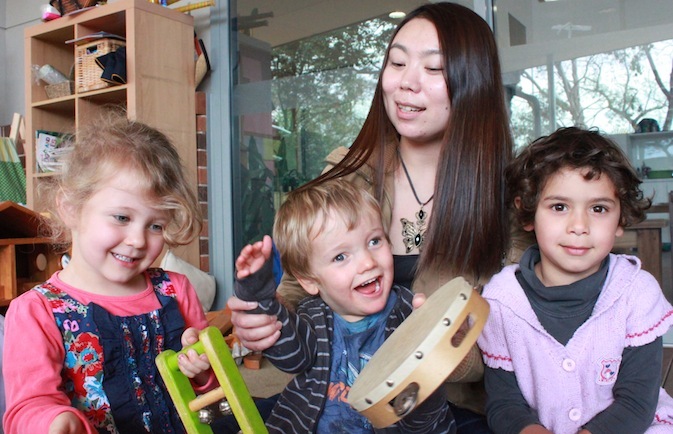 He attends The Infants’ Home, where he accesses an on-site speech therapist, occupational therapist, play therapist, GP and a team of passionate educators as part of the organisation’s integrated service model. Ingrid Maack reports. Let’s go walking, walking, walking. Let’s go walking far, far away,’ a visiting physiotherapist sings to Harry as he squeals with delight and walks forward in his walking frame. Rattler was lucky enough to see this delightful exchange during a visit to the new Gorton House at The Infants’ Home in Ashfield, Sydney, where Harry Davenport (aged four) attends five days a week. ‘This is new. He usually walks backwards,’ explains Jody Shepphard, a physio who visits Harry on-site at The Infants’ Home every fortnight. ‘Were having a good day today,’ she says. ‘He’s really come on lately. It’s only four weeks since he first started standing upright. ‘We placed a ribbon across the bottom of his frame to stop him pulling his legs up and this has really helped strengthen and straighten his legs,’ she says. Harry is vision-impaired, has profound developmental delays and limited muscle control. Ms Shepphard has worked with Harry since he was 10 months old. She used to visit him at home but now conducts her sessions at Gorton House, where she is able to teach staff techniques they too can use to help Harry strengthen his muscles and improve his mobility. Harry’s father Andy says the service has been ‘life-changing’ for Harry and his family, with its delivery of early childhood education, early intervention and specialist health services. 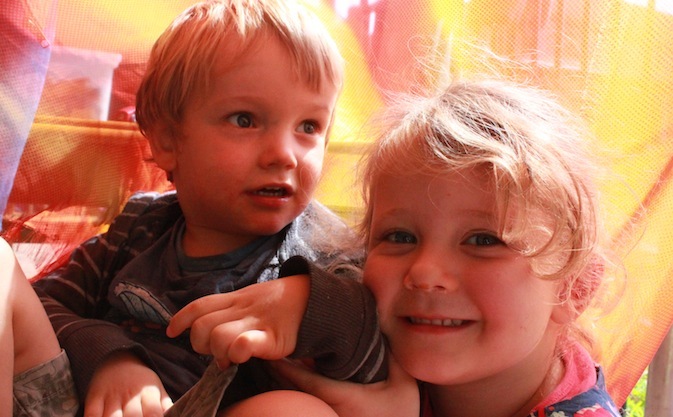 When Harry was just nine months old, Andy and his wife Emma, were told by doctors that he was mostly likely brain-damaged and vision-impaired, but to date he still has no official diagnosis. ‘My wife was due to go back to work and the centre where Harry was wait-listed and where my older son, Oliver, went, reneged and said they could no longer take him,’ he says. ‘We didn’t know how we were going to cope. Lynn Farrell heard our story and said we were welcome at The Infants’ Home—that was three years ago! Gorton House is a purpose-built education and care service located within the sprawling leafy grounds of The Infants’ Home. 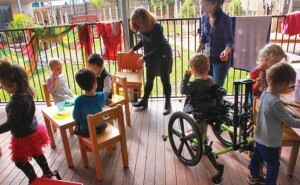 It opened its newly-renovated doors in July 2013 and is the first stage of The Infants’ Home plans to build a 240-place integrated early education and care centre. Gorton House is one of five licensed education and care services at the Ashfield site designed to meet the complex needs of families in Sydney’s inner-west. Each education and care service has a 30 per cent intake for children with vulnerabilities or additional needs. As well as early learning and care services, it also offers family day care, play groups, post-natal support, parent education and family support as well as health clinics and access to an on-site speech therapist, occupational therapist and GP for immunisations, eye tests and general consultations. The Infants’ Home is recognised as a pioneer in its integrated service model, working collaboratively with professionals from diverse disciplines to facilitate the inclusion of children with additional needs into mainstream services. 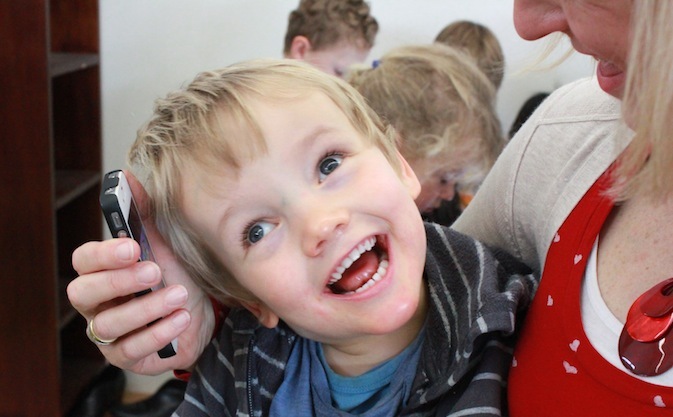 During my visit to Gorton House, I soon see that Harry’s hearing is unaffected and I watch him respond beautifully to the music and images on Jody the physiotherapist’s iPhone. ‘His visual attention has gone from a few seconds (focusing on the iPhone) to half a minute,’ she enthuses. Despite his lack of vision, Harry also responds to the sound of planes as they fly overhead and to the children as they brush past, touch him or hand him toys. ‘Children are naturally inclusive,’ says Lynn Farrell, the Integrated Services Manager at The Infants’ Home. ‘Harry is an amazing child. You quickly see the child beyond the disability. He’s not treated differently in terms of relationships. He is valued for the unique person that he is, as is every other child here at The Infants’ Home,’ she says. ‘Once you get to know Harry you are able to read his signs. He doesn’t have any verbal language but he can certainly communicate his needs. ‘It is difficult for mum and dad because Harry doesn’t have an official diagnosis,’ Ms Farrell says. ‘There is nothing specific for them to hold onto, which makes it so hard for them, as they don’t know what the future holds. And Harry doesn’t have the skills to tell us what’s wrong. There are days when he cries a lot but we don’t know if he is pain or just emotionally distressed. Harry has low muscle-tone but has specialised equipment, including a wheel chair and a walking frame, which means he is not excluded from activities. The concept of inclusion is apparent in the design of this new space. Blessed with abundant natural light, Gorton House has high ceilings (great acoustics for children with cochlear implants) and there are low-chairs (not high chairs) so children in wheelchairs can sit at the same level as other children. There are also hydraulic nappy change benches so staff don’t injure their backs as well as special markings on the floors for children with visual impairments. There is an intake process, explains Ms Farrell, who says she and the early childhood nurse meet families, assess the child’s needs and the organisation’s capacity to provide an inclusive environment. However, inclusion is not only about access to resources, it is also about the attitudes of staff, Ms Farrell says. ‘It’s around seeing and valuing each and every child. Feedback from parents, especially those who have a child with a disability, strongly supports an integrated model. Ms Farrell also believes early childhood educators everywhere play a key role in recognising the need for early intervention. For this reason she says it is important to keep qualified teachers and highly experienced staff who see their role as a profession and are able to make those kind of judgements calls. ‘You have a different set of lenses if you see this as your career and your professional role. You are much more invested in children and children’s services,’ she says. At an integrated service, it is clearly much, much more!